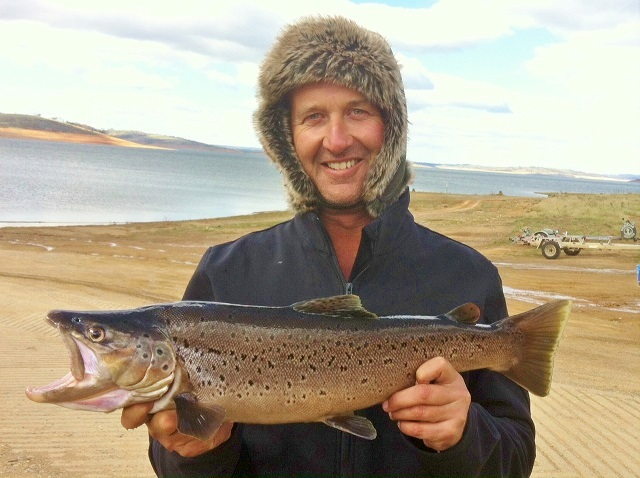 Fishers are invited to attend a public forum on the Snowy Mountains Lakes trout fishery with Department of Primary Industries (DPI) managers and scientists in Cooma on 29 May 2014. DPI Inland Senior Fisheries Manager, Cameron Westaway, said some fishers have reported reduced catches of rainbow trout in Lakes Jindabyne and Eucumbene during the past two years. “While brown trout catches have continued to remain stable in the lakes and the brown trout spawning fishery has been excellent, we have received reports of lower rainbow trout catches from some fishers using traditional surface and shore based fishing methods – while other fishers have reported good catches using deeper trolling methods,” Mr Westaway said. “Various theories for these changes in catch rates have been suggested by the public. These fisheries provide significant social and economic benefits to the region and we are committed to their long term success. “The forum will give fishers the opportunity to hear about the current trout stocking program, management practices, and updates on research. “Leading New Zealand scientist Dr Michel Dedual from the Department of Conservation in Turangi will provide insights into the iconic Taupo trout fishery which has also experienced changes in catch rates of rainbow trout in recent times. “Importantly the forum will enable DPI managers to gain feedback from the fishing public on some of the most popular trout fishing locations in NSW. This feedback will assist DPI and the angler based Snowy Lakes Strategy Working Group who provide direct advice on the management of the fishery. Fishers are also reminded that it will be a great opportunity to fish the Thredbo River and Eucumbene River trout spawning runs before the trout closed season begins on 10 June 2014. Sign up for free weather alerts for coastal and inland waters! Rivers have picked up very well now with the spawning run plenty off brown are running up with good reports off fish around Providence down most fish are taking the glow bugs and Nymphs but don’t forget the spits shot you must get to the bottom for better results. Remember from the 1st off May you are only aloud one fish over 50cm. If you are seeing anyone doing wrong you can call fisheries on 0427460226. Just a reminder there will be no camping on the rivers at Eucumbene with Tents the police are make campers move up to the camping areas or camping sites near the river. Few good reports off fish around the 11lb mark have been caught. Remember if your spinning with flies your only aloud two flies rigged up on your rod we are getting reports off fishermen rigging up with five flies or more stick with the rules and you won’t have to worry about the fisheries officers and they will be up there every weekend from now on and week days. we are starting to get reports off fish from the bridge down off good browns running up but with the lake up so high there’s not much river to fish but with the rain starting to fall the fish should start move up higher. At the moment the river is running well and the fish are starting to move. So as the river is running well get that split shot on and get to the bottom and you will get the results you are looking for remember you are only aloud one fish over 50cm from the 1st off May. Things have Improved at the lake with good reports around the lake on the fly with the rainbows yes hard to believe but with the reports coming in the Lumo Baby Dolls being the stand out fly. Most reports are coming in around the Braemer bay, Cobrabald bay, Walnui bay and believe it or not Rushes bay most of these fish are taking baby dolls so spark them up at night time and have a go. It’s good to see the rainbows are moving around. At Buckenderra things have been a little quiet but with all the reports coming in the baby doll is the way to go that’s one fly I haven’t tried I will now. Remember you will need a good light to spark them up. Best areas are Anglers Reach, dam wall, old Adaminaby, springwood bay and Rushes bay. Still a little quiet around the shore line on the fly best places we have got reports on are hay shed bay, the boat club, and around poo bay late in the afternoons have been the best on woolly buggers, Mrs Simpsons, woolly worms. Maybe the Lumo baby doll the way to go as well you can only try???? Pete caught this 66cm Brown on a Red "Stukey" weight around 7.5 Ib at the Adaminaby boat ramp Anzac Weekend Trolling. Bait Fishing Eucumbene and Jindabyne. bait fishing is picking up after all that rain worms are the stand out bait. Bait fishing has been picking up around most areas with the worms being the stand out bait. Just remember there’s no need to throw out to deep try to keep your worms close to the bank with the power bait make sure you only have a meter long lead and a small hook again not to deep most fish are in close. Mudeyes have been hard to get and they will be for some time now but don’t worry the worms are working well. Eucumbene Best places to fish are Seven gates, Rushes, frying pan, Anglers Reach, dam wall. Jindabyne Best places to fish are Poo bay, Kalkite, east jindy, waste point and around the snowline caravan park. Good morning Michael a couple of photos of a Brown Caught in Buckenderra angler is Alan Hocking. Caught on a Black crick hopper I bought from the shop 15 years ago. I use the lure all the time here on lead core line I caught another smaller brown as well. I was only on the water for 1 hour the brown was on a red nosed brown bomber Tassie Devil. Eucumbene has been up and down better results around buckenderra with most fishermen using Minnows and Tassie Devils. After all this rain thing are going to get better with the water cooling down with the rainbows moving in closer and the browns people are starting to get mixed bags of fish. Anglers Reach has been picking up with some good browns taking sting lures and blades over at the dam wall things have been good spinning of the banks and trolling. Overall the trolling has been good in most areas on the lake. Jindabyne has been a little quite at times but with all the rain trolling around the Thredbo river mouth should be the place to be with plenty of food washing down the river. Not a bad idea to start looking for all the wash areas around the lake this is where you will find more activity and more food. If you are up that way fishing let us know how you go!! !